Originally introduced in 2009, the Chronometre Bleu has become a best-seller at F.P. Journe. This is a time only watch that is highlighted by its mystical “chrome blue” dial, which as you can see from the images, reflects light in a way that it appears bright blue to dark blue depending on the viewing angle. 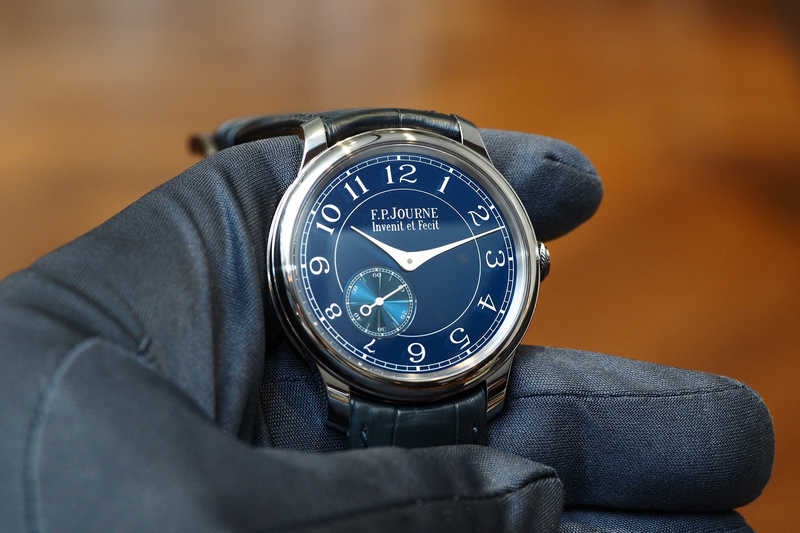 The simplistic “chrome blue” dial features Journe’s signature hour and minute hands in white, along with white printed Arabic numerals, and a snailed finish small seconds counter (at 7 to 8 o’clock), with a white hand and a large open circle counterweight. The small seconds subdial has a bevelled edge and a snailed surface, and notably takes up a portion of the space where the hour markers are positioned so to accommodate this the designer made the two adjacent Arabic numerals, slightly smaller. This throws off the balance of the dial a little bit but is so subtle I doubt it is an issue for most people. Driving the hours, minutes, and seconds is the manually wound caliber 1304, which beats at 3Hz, and has an 18K rose gold mainplate and bridges (as do all F.P. Journe watches). The movement is, of course, finished to the highest standard, with Geneva stripes, perlage, Barleycorn guilloché-work, polished screw heads, chamfered slots, pegs with polished rounded ends and chamfered and polished edges on the bridges. 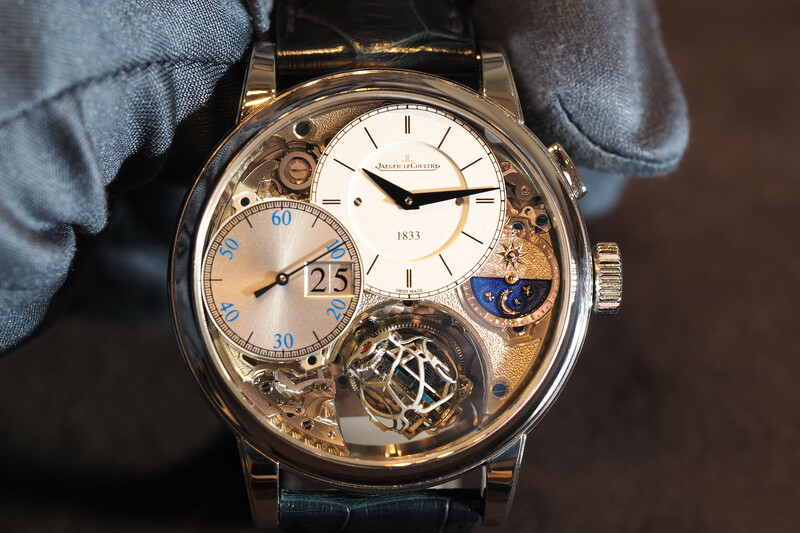 The movement has 129 components, 22 jewels, and measures 30.04 mm x 3.75 mm. Two mainspring barrels in parallel offer a 56-hour power reserve and are specifically designed to deliver power consistent across that entire time, thus improving accuracy. The watch case is conservatively proportioned (39 mm x 8.60 mm), and is crafted from a unique material called Tantalam, which has been fully polished, and that has the look of a precious metal, like platinum, for example, and even feels heavy, but with the added advantage of being much more resistant to scratches. 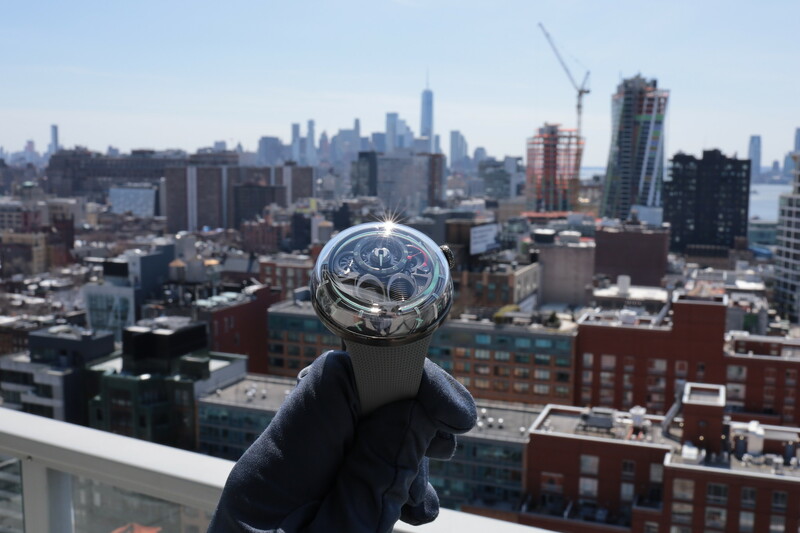 The case has short, articulate lugs, and a flat crown, that maybe gives up a little bit of grip in order to make the watch more comfortable on the wrist, but that I still found it easy to operate. Overall, the dimensions and ergonomics result in an excellent wrist presence and feel. The retail price is $23,300 which has gone up quite a bit since being introduced 7 years ago, but that is because there is high demand for the F.P. Journe watches, which are produced is very low quantities each year. 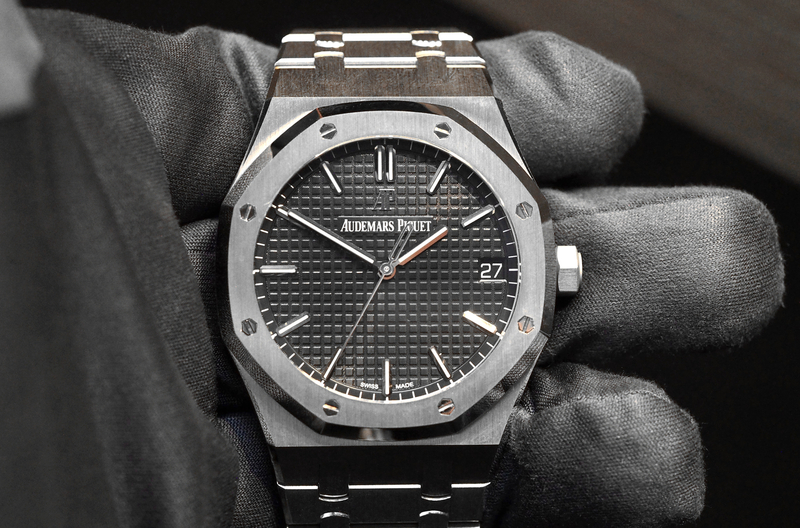 And the advantage in this case as a collector is that you know your watch will likely continue to appreciate due to the relative rarity and high demand. Not to mention that the watch and movement are stunning, and have the benefit of looking like no other watch on the market.